The Dark Brotherhood Murderers are fresh recruits that appear in the Dark Brotherhood Sanctuary at the conclusion of the Dark Brotherhood questline, Honor Thy Mother. The Murderers are the lowest ranking initiates of the Dark Brotherhood and recent additions to the Sanctuary, as evidenced by their ignorance concerning Sithis and The Night Mother. For example, "S... Sithis? Well... I am just a lowly Murderer, but... But I know Sithis is our Dread Father. When we kill, we send him souls! Is that right?" and "You... you're asking me about the Night Mother? Well, I... I mean... she is our Unholy Matron! She... she speaks... to you!" They apparently learn quickly enough, however, as they will bless you with either "May the Night Mother always watch over you, great Listener," or "May... May Sithis keep you safe, most revered Listener. If you ever need my help, you need only ask!" on a constant basis. The Murderers will follow you on command, although only one Murderer may follow you at any given time. As they put it: "Oh! It... It seems you already have a family member traveling with you, dear Listener. Perhaps I can help, when you are done with their services?" If you are alone, however, they will be more than glad to join you: "Yes, honored Listener? Do you have orders for me?" Decline, and they will leave you with a standing offer: "If you ever have need of my abilities, dear Listener, just say the word." They will further debase themselves in your honor by ending the conversation with: "I shall never forget the talk we had. Your very presence in the Sanctuary is a blessing from the Dread Father himself!" They have a disposition of 100 and are generally quite obsequious in their interactions with you. Each Murderer wears shrouded armor. The Archer also wears a shrouded hood. All three are eager to serve their Listener and will constantly tell you, "I can hardly believe you're standing here in front of me! The Listener himself/herself! This is such an honor! ", "*Gasp! * Listener! How may I serve you? ", and "I am yours to command, oh great Listener!" If one of them should die, then they will respawn next to you in one week, assuming you haven't chosen another one to follow you. If you have, they will respawn at the Sanctuary. 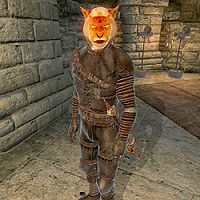 This Murderer is a male Khajiit Assassin and can be found in the Sanctuary's Training Room. He has a decent amount of health but is unable to heal himself. He wears a set of shrouded armor. He carries a silver shortsword and a leveled shortsword. This was likely intended so he would always be capable of fighting enemies resistant to normal weapons. He also carries thick cowhide shoes for some reason. He will sound like an overeager fan when you first meet him: "Oh! Most honorable Listener! I... I am so pleased to see you! Sorry, I don't mean to be nervous, it's just that, well... I am awed by your presence!" He'll be more than glad to join you on a mission however: "Yes, most revered Listener! My blade will rend flesh at your command!" Despite his nervous initial greeting, he is actually the most forthright of his companions when asked about rumors, saying, "Well, the others and I have been talking.... Is it true? About the traitor? It's frightening to think he infiltrated the Brotherhood so easily." This Murderer is a female Breton Mage. She can be found in the Sanctuary's Living Quarters. Her magical repertoire consists of the same spells she would sell to you, most notably two frost damage spells and a restoration spell. She wields a silver dagger. 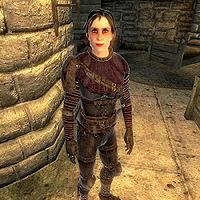 When you first meet her she will say, "It is an honor to speak with the living legend of the Dark Brotherhood! Your deeds are an inspiration to us all!" If you ask her to join you on a quest, she will jump at the chance and say, "Yes, most revered Listener! My spells will serve Sithis until I lie cold and dead!" Ask about rumors and she will tentatively ask this in return: "I... I heard what they did to Lucien Lachance... Is it true that Arquen feasted on his entrails?" She offers merchant and spell services and will purchase stolen goods, although she only has 300 available gold. She sells the same spells that M'raaj-Dar previously offered, although she does not sell any of the unique items that were offered by M'raaj-Dar. She will not offer these services while following you or when under orders to stay at a location. Just as with M'raaj-Dar, it is not possible to invest in this store, even after you have reached 75 skill in Mercantile. She acts as a fence, meaning that you can sell stolen goods to her and they will count towards fenced items when completing the Thieves Guild questline. The Dark Brotherhood Murderer merchant is one of only three service providers in the game who cannot be persuaded. This means that it is more awkward than usual to access her barter menu. On the Xbox 360 and PS3, the down control does not work; you must instead use the left or right controls (either via the thumbstick or direction controls). Luckily, there is no need to increase her disposition, as her membership of the Dark Brotherhood Underlings faction means it will always be at 100. † This is the only on-touch Open spell in the game, and it is impossible to create other touch Open spells; see the effect's notes. It is cheaper than a custom spell of the same magnitude because it is on-touch instead of on-target. Its unusual magnitude (12 points instead of the standard 20 for an Open Easy Lock spell) also means that it will not open all easy locks; see the article on Open for details. 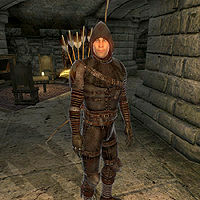 This Murderer is a male Imperial Archer. He can be found in the main hall of the Sanctuary. He is armed with an iron bow, iron arrows, and leveled magic arrows but does not carry a melee weapon. He wears a set of shrouded armor and a shrouded hood. Upon first meeting him he will cry, "Listener! I am a new initiate to the Dark Brotherhood, just a lowly Murderer, but if there's any way I can serve you, any way at all, I am yours!" Asking him to join you will have him eagerly tell you, "Yes, most revered Listener! My bow is yours!" He only has one rumor: "Rumors? Oh! Well... Um... I... I heard you're the one who killed Adamus Phillida! The skill you must possess!" "Follow me, and keep pace. ": The Murderer will follow you at a reasonable distance. They may talk to other NPCs if you are moving slowly or hanging around an area. "Follow me, with utmost haste! ": The Murderer stays close to your back and tries their best to keep up. They do not talk to NPCs. "Follow me, but remain hidden! ": The Murderer casts a 15 point Chameleon spell and follows in sneak mode. They show their compliance by saying, "Yes, honored Listener! I shall become shadow!" "Stay here, underling. ": The Murderer will not move from the specified spot, but will still attack enemies that come close. They demonstrate their eagerness to serve your will by saying, "Of course, Listener! I will remain here until you say otherwise!" "Begone! I am done with you! ": The Murderer will stop following you and return to the Sanctuary. Note that you cannot talk to them while they are returning to the Sanctuary, thus you cannot tell them to follow you once more until they've reached the Sanctuary. They seem reluctant but wouldn't dare to offend you; instead they say either "Y... Yes dear Listener! I... I will wait in the Sanctuary until you have further need of me!" or "I... I am returning to the Sanctuary, as quickly as I possibly can, oh great Listener!" This page was last modified on 20 October 2015, at 05:23.